In the last few posts I have moved from building an Azure SQL DB with Terraform using VS Code to automating the build process for the Azure SQL DB using Azure DevOps Build Pipelines to using Task Groups in Azure DevOps to reuse the same Build Process and build an Azure Linux SQL VM and Network Security Group. This evolution is fantastic but Task Groups can only be used in the same Azure DevOps repository. It would be brilliant if I could use Configuration as Code for the Azure Build Pipeline and store that in a separate source control repository which can be used from any Azure DevOps Project. Luckily, you can 😉 You can use Azure DevOps Job Templates to achieve this. There is a limitation at present, you can only use them for Build Pipelines and not Release Pipelines. I created a GitHub repository to hold my Build Templates, feel free to use them as a base for your own but please don’t try and use the repo for your own builds. The easiest way to create a Build Template is to already have a Build Pipeline. This cannot be done from a Task Group but I still have the Build Pipeline from my automating the build process for the Azure SQL DB using Azure DevOps Build Pipelines blog post. Now I can use this yaml as configuration as code for my Build Pipeline 🙂 It can be used from any Azure DevOps project. Once you start looking at the code and the documentation for the yaml schema you can begin to write your pipelines as YAML, but sometimes it is easier to just create build pipeline or even just a job step in the browser and click the view yaml button! I am going to create a new Azure DevOps Build Pipeline and as in the previous posts connect it to the GitHub Repository holding the Terraform code. I am going to give it a name and it will show me that it needs the path to the yaml file containing the build definition in the current repository. The build.yaml file looks like this. The name is the USER/Repository Name and the endpoint is the name of the endpoint for the GitHub service connection in Azure DevOps. The template value is the name of the build yaml file @ the name given for the repository value. It also defaults the trigger to automatic deployment. and when I get the Terraform code wrong and the build fails, I can just alter the code, commit it, push and a new build will start and the Terraform will work out what is built and what needs to be built! This weekend (10 December 2016), I went to Slovenia for a SQL Saturday. As always, it was an amazing event well organised by Mladen Prajdic, Dejan Sarka, and Matija Lah in a fabulous setting amongst fabulous scenery. I highly recommend it and, also, Ljubljana is a wonderful place to be in December with all the lights and markets. Whilst I was there I was asked by someone if you could deploy data science virtual machines in Azure with PowerShell. I said I was sure that it could be done and agreed I would write a blog post, so here it is. The Data Science Virtual Machine running on a Windows Server 2012 contains popular tools for data exploration, modeling and development activities. The main tools include Microsoft R Server Developer Edition (An enterprise ready scalable R framework) , Anaconda Python distribution, Jupyter notebooks for Python and R, Visual Studio Community Edition with Python, R and node.js tools, Power BI desktop, SQL Server 2016 Developer edition including support In-Database analytics using Microsoft R Server. It also includes open source deep learning tools like Microsoft Cognitive Toolkit (CNTK 2.0) and mxnet; ML algorithms like xgboost, Vowpal Wabbit. The Azure SDK and libraries on the VM allows you to build your applications using various services in the cloud that are part of the Cortana Analytics Suite which includes Azure Machine Learning, Azure data factory, Stream Analytics and SQL Datawarehouse, Hadoop, Data Lake, Spark and more. I have created a function to wrap around the process to make it easier for none PowerShell people to do this. There are a series of steps to follow below and you should be able to create a machine in about 10 minutes once you have completed the pre-requisites. First, an annoyance. To be able to deploy Data Science virtual machines in Azure programmatically you first have to login to the portal and click some buttons. In the Portal click new and then marketplace and then search for data science. Choose the Windows Data Science Machine and under the blue Create button you will see a link which says “Want to deploy programmatically? Get started” Clicking this will lead to the following blade. To install a data science VM, we’ll use the New-WindowsDataScienceVM.ps1 script. In this script, I’m using version 1.2, but any version of this script published in PowerShell Gallery is fine. For more information about using the PowerShellGet cmdlets to install scripts and modules from PowerShell Gallery, read this page. The PowerShellGet modules is included in PowerShell 5.0 and later on Windows 10, but you can install PowerShellGet for PowerShell 3.0 and 4.0. If you cannot connect to the gallery or prefer not to install the module, you can also find the script on GitHub. The New-WindowsDataScienceVM function comes with a Simple switch parameter. 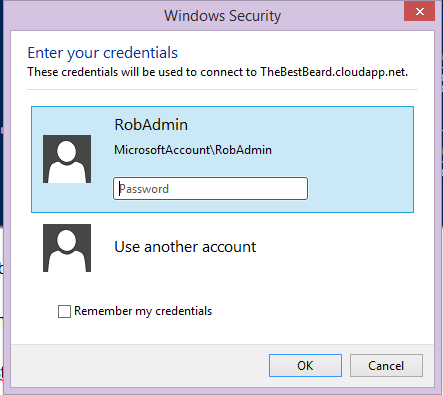 When you run the function, it prompts for a local admin username and password to log into the virtual machine. The password must have 3 of the following 1 Upper case, 1 lower case, I special character and 1 number. Don’t lose it, you will need it. Copy and paste the correct code from the output at the end of the script to launch the RDP session and save the RDP file to your documents folder for later use. You can copy the correct Virtual Machine name and Username from the output at the end of the script. If you have forgotten your password, you can reset it in the Portal. You are then logged in and can carry on. Once the Azure PowerShell modules and script are installed you would be able to have a machine up and running within 10 minutes. This will remove ALL resources in that resource group, so be careful if you have deployed anything else. Msg 3271, Level 16, State 1, Line 1 A nonrecoverable I/O error occurred on file "https://storageacccountname.blob.core.windows.net/CONTAINERNAME/databasename_log_dmmyyhhss.trn':" Backup to URL received an exception from the remote endpoint. Exception Message: The remote server returned an error: (400) Bad Request.. Msg 3013, Level 16, State 1, Line 1 BACKUP LOG is terminating abnormally. A nonrecoverable I/O error occurred on file "https://storageacccountname.blob.core.windows.net/CONTAINERNAME/databasename_log_dmmyyhhss.trn':" Backup to URL received an exception from the remote endpoint. Exception Message: The remote server returned an error: (400) Bad Request..
Every good DBA should have a DBA database. A place to store information about all of their instances and databases. All data shown in the examples below has been generated from real-life data but all identifiable data has been altered or removed. I have no servers in Bolton, it is where I am from originally!! Then I started to play with the data. This is probably not how a professional would phrase it but I would say that if you don’t know how to use a new application be brave and give it a try. OBVIOUSLY you are a PROFESSIONAL DBA and will not do anything that would endanger production, use a backup of your database and work locally if you need to. I then decided to look at the number of SQL 2005 instances that I had and as I had relationships between SQLInfo and Instancelist and Clients I could build a more dynamic report. This is very cool and I hope you can see how useful this could be and how brilliant it would be to enable relevant people within the organisation the ability to look at that report and answer their own questions. So you can simply pass the report file to your colleagues to enable them to use it or you can publish it to Powerbi.com. I am not going to go into any detail about the costs or licensing etc I will just say it is as easy as clicking publish. If you wish to have the information automatically refreshed there are some more steps that you would need to go through which are detailed here which enable you to connect your on-premise database to Powerbi using the data management gateway, alternatively you can simply refresh the data in the report and then publish it and replace the existing report. but to create new folders we need to remove the “C:\temp\TestUpload” and replace it with the Directory name in Azure. I chose to do this as follows using the substring method and the length of the source folder path. The last post about Launching Azure VMs with PowerShell made someone ask me to explain how I start my Azure VMs normally so here goes. Get-AzureVM shows me the VMs associated with that subscription. and my machines are stopped and no longer running my credit down.